The sport of tennis is a brotherhood, a metaphorical family of those who love and play the game. However, the Swenson brothers of Scottsdale, Arizona (Jack, Connor, Chase) are taking that brotherhood statement to a much more than literal meaning, proving that the bounce in the Swenson house centers around the fuzzy yellow tennis ball. This like-minded set of Arizonan boys all love tennis, play tennis and have a not-so-unique fondness for Roger Federer and playing chess. At 13, Jack is the eldest of the three Swensons and currently sits at No. 19 in the Southwest in the Boys' 14 and Under division. Middle brother Connor is 11, and is ranked No. 13 in the Southwest Boys' 12 and Under division, while youngest sibling Chase just got started in the sport last year, but is already trying to emulate his brothers' on-court success and zest for the game. 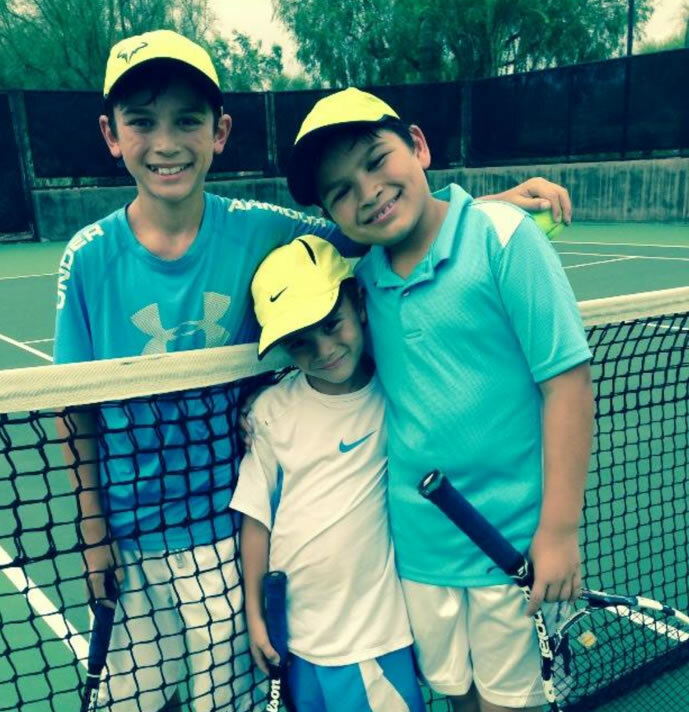 We recently caught up with this brotherly tennis trio to learn a little bit more about each of them and their enthusiasm for the sport of tennis. How did each of you get your start in tennis? Jack: I started playing tennis when I was little when my parents hit balls with me at our neighborhood courts. Connor: My family and cousins play tennis so I held my first racquet when I was 2 years old and started playing with my older brother Jack when I was 4 years old. I got competitive in tennis when I started playing tournaments. Chase: I pretty much got started by watching my two older brothers play. Since you began, what's been your best competitive tournament experience? Jack: My best tournament experience was winning the Southwest L3 in 2015. Connor: My best tournament experience is playing with all the great players in the 12s in the Southwest. I've made some really good friends in tennis so far. Chase: I liked the Valley of the Sun L6 tournament (in El Paso) the best so far because I liked the people I played. They were all really nice. What was your very first USTA Southwest tournament? How old were you at the time and how did you feel approaching the match? Jack: My first Southwest tournament was a Superset when I was eight. I don't remember how I felt too much. I do remember I liked it and wanted to play again right away. Connor: My first tournament was a Super Set in the summer of 2013. I was eight. I wasn't nervous at all, because I was so excited to play. Chase: My first match was the Scottsdale L6 last year when I was six. I felt nervous starting knowing it was my first event. But I had a lot of fun. What is your ultimate goal with the sport of tennis? Jack: My goal in tennis is to be the best player and competitor I can be. I also want to be a good teammate to my doubles partners and a good student for my coaches. I feel my best when I play tennis. Connor: I would like to keep playing tennis through college, wherever I end up. I'd also like to teach my own kids to play someday and to love tennis as much as I do. Chase: I want to be the best I can be. Jack: I like to watch tennis, watch movies, and play Chess when I am not playing tennis. Connor: I like to hang out with my friends when I'm not playing tennis. Chase: I like to play soccer and chess. Who is your favorite tennis professional? What would you do if you were to meet him/her? Jack: My favorite tennis pro is Roger Federer. If I met him I'd ask him about his life through tennis. Connor: My favorite player is Roger Federer. If I met him, would like to play tennis with him and get advice about tennis from him. Chase: Roger Federer for sure, and I would ask if he would like to play tennis with me!